Available in two standard widths and up to three sections in height. Keeps the heat inside the oven and maintains low temperature on the outside. The panel have large and clear controls and with the correct time setting and temperature. Easy to understand and control. Makes the ovens easy to clean both internally and externally. Canopies at infeed and outfeed ends. Gives you a good working environment. Stepless control of top and bottom heat and stepless baking time control 2 – 10 minutes full control in the baking process. Easy to handle, understand and set. Convenient detail that makes moving of the oven easier. Available in four standard widths and up to three sections in height, standard crown height 160 mm. 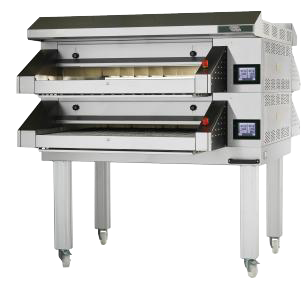 Gives each pizzeria the ability to create the oven that suits its needs best. The well insulated oven chamber. Classic pizza baking requires solid stone soles. Precision-built oven doors and damping with ceramic glass in the doors Gives the door a smooth action and ensures convenient and safe handling. Effective working halogen lighting Provides whiter and more intensive working light than standard bulbs. Each oven section can be individually and stepless controlled with separate settings of the top, bottom and front heat. Full control in the baking process. Easy to handle, understand and program. Convenient details that makes handling and baking easier. A pizza oven that retains its heat! 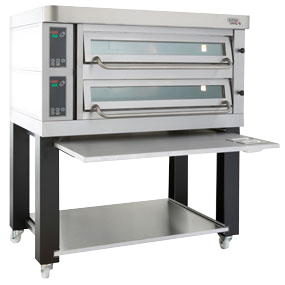 This unique and well insulated oven with double tempered steel glass is extremely energy efficient, its very economical to use and distributes the heat very evenly ensuring that the pizzas are cooked correctly without having to move them during baking. 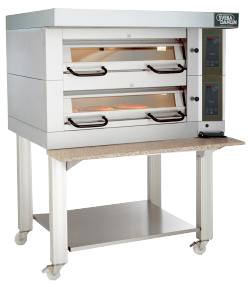 The P600 is optimized to handle 6 pizzas with 35 centimeter diameter per deck. The oven will be available from one deck up to 3 decks high. With the week timer you can program start and stop times for the entire week, this means that the oven will always be at the correct operating temperature when you start your day. The double glazed door retains the heat inside the oven chamber better compared with a single door glass. This gives a better baking result as well as a better working environment. The robust door structure with the ergonomic handle is easy to open and close. There are two robust, pull out shelves with bowls under the oven. These work perfectly as stands and allow you easy access to products such as spices and oils. 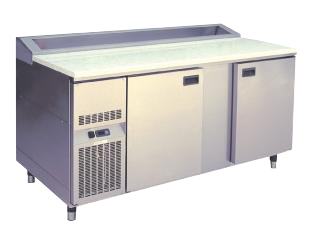 Made of stainless steel and has an easy to clean working surface. With this work bench you will get more efficient in handling ingredients and making pizza. Toppings are stored in containers which are recessed and kept cool in the bench. Resulting in always fresh and accessible ingredients.